Great Scanner, prompt and efficient service from tradescanners. In fact we bought another scanner. The Epson WorkForce DS-70000N offers reliable, high-quality document capture, conversion and distribution into document management systems. 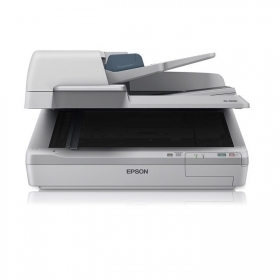 This A3 document scanner is ideal for companies with heavy scanning needs and features Epson's built-in Network Interface Panel for multiple users. Engineered to integrate seamlessly into complex IT systems, this high-performance device can handle large batches of documents in a single go, quickly and efficiently. With a scanning speed of 70ppm/140ipm, it also ensures heavy-duty scanning jobs are performed effortlessly. This scanner provides fast and trouble-free scanning due to a 200 A3-page ADF, one-pass duplex scanning and Double Feed Detection. This scanner and its features can be shared between multiple users with the built-in Network Interface Panel. Combined with Document Capture Pro solutions, the Network Interface Panel allows users to benefit from Push Scan features and customise "scan to" job functions, such as "scan to email" or "scan to Microsoft SharePoint" among others. These features enable complicated tasks to be carried out effortlessly. Document Capture Pro makes it easy to integrate this document scanner into your document management system, speeding up workflow and enabling users to capture, convert and distribute scanned information in virtually any document repository or document management system. Epson ReadyScan LED technology eradicates warm-up time and lowers power consumption.